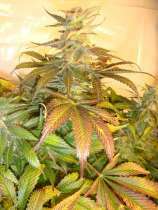 Here you can find a strain description about Mach Fly - Moscaseeds and also some user-based reviews and infos directly from the SeedFinder (if available). You can also find the offers and auctions here if Mach Fly - Moscaseeds cannabis seeds are on stock at MyCannapot right now. Mach Fly is the result of combining a Warlock female with my proven C99 male. Fast growing plants which are quite aggressive growing once established. The Mach Fly high is cerebral in nature and excellent when trying to finish a project and getting things done. Geat high with no apparent ceiling. Apricot flavors abound! Solid colas with tight nugs! Mach Fly - Moscaseeds is not available at our shop at the moment!